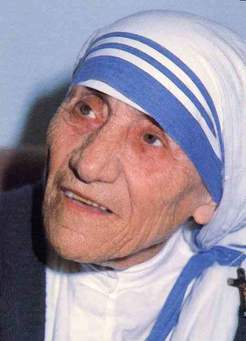 Teresa of Calcutta Agnes Gonxha Bojaxhiu, the nun known to the world as Mother Teresa of Calcutta, was born to Albanian parents in what is now Macedonia in 1910. As a Sister of Loreto, she taught girls in her order’s mission schools in India for twenty years. But in 1946, on a train journey in the mountains, she suddenly realized that God was calling her to something more—to care for the poorest of the poor. In the city of Calcutta, many homeless people lived and died on the street. One day Sister Teresa came across a half-dead woman lying in front of a hospital. She stayed with the woman until she died. From that time on, she dedicated herself to caring for the poorest of the poor in India. She founded the Nirmal Hriday (“Pure Heart”) Home for the Dying in a former temple in Calcutta, where poor, homeless people were cared for and allowed to die with dignity when no one else would have them. She also founded an orphanage and leprosy hospital. Other young women, including some of her former students, soon joined her in her work with the sick, the poor, and the forgotten of Calcutta’s slums. They formed a new worldwide order of nuns, the Missionaries of Charity. 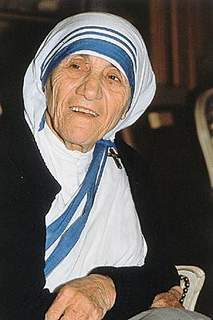 Like Mother Teresa, they wear a plain white, blue-edged sari, the traditional dress of Indian women. They live a simple, prayerful life, and take care of people all over the world wherever there is need.